When I was still on the planning stage of my trip, I discovered Shambara Guesthouse. It looks great in the pictures, and every site I came upon have rave reviews for Shambara, from travelers who have stayed there before. 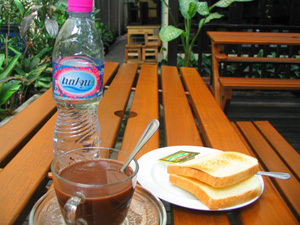 I wanted to stay in Khao San Road, and Shambara’s the best guesthouse in the area for me. However, I learned that neither the BTS or the MRT have a station anywhere near Banglamphu. I don’t want to depend on taxis to get around Bangkok, and I was still wary about the Chao Praya River Express. But still, I wanted to see what’s all the fuss about Shambara. Luckily enough, the Lomprayah bus that I will be taking from Ko Pha Ngan will have its last stop at Khao San Road, so I reserved one night in Shambara. It was easy enough to find, though as most complained, taxi drivers can’t find it. That’s because it’s in a soi or an alley off Khao San Road, not along Khao San itself. That made Shambara’s location great, in my opinion. by being in the alley in one end of Khao San, you’re relatively near where all the action is, yet far enough to have peace and quiet. The rooms are just the right size. 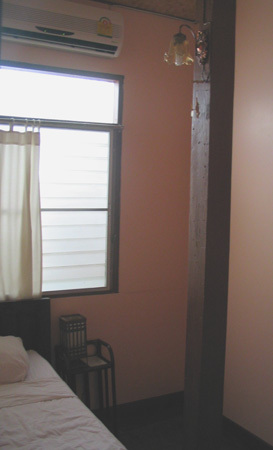 Well, I’m not sure if I can say the same if there are 2 of us in the room, but the single room is spacious enough for 1 person, a single bed that’s not too narrow, a small bedside table, a bamboo towel rack, a wooden post, and a bulky backpack. Considering my odd working hours, I still have a hard time falling asleep during the night, even when I’m awake the whole day. While I was able to get enough sleep in my previous huts and rooms, the best sleep I had was at Shambara’s. Maybe it’s the matress that had just the right amount of firmness, the fairly quiet airconditioning or the relatively soft pillows – I had a pretty deep sleep and I was surprised to see that it was already almost 10am when I woke up. As for the toilet and bath… Ah, it was heavenly. Well, they don’t have a tub or bidet, but after the bathrooms I’ve been through, Shambara’s was God send. Okay, I’m being too dramatic, but the toilet and shower stalls were clean. There are 3 toilet stalls that’s small enough without being too small, and 2 shower stalls with enough room to move around and ensure that your dry clothes remain dry. The big downer was that there was only one sink so you’d have to wait your turn if somebody’s using it.There are only about 7 or 9 rooms in Shambara, so if all the facilities are occupied, you wouldn’t have to wait too long for your turn. Shambara offers their guests free breakfast. Most complained that it’s not really a breakfast, but it’s enough wake you up. You get one drink (coffee, tea or hot chocolate?) and 2 pieces of toast (would you like some jam or butter with that?). You can have this at the small garden in front of the house. The tables are shaded by the big tree, so you won’t get roasted by the sun while eating. So will I stay at Shambara again? Well, I still have lots of temples to see in Bangkok, and most of these are in the Rattanakosin and Banglamphu area… Though one of the main appeal of Bangkok to me would be the shopping, I will still venture out to Shambara to stay at least for one night or even just to try their restaurant. Looks like a good, clean hotel. It can be cramped, but please let the bathrooms stay CLEAN! Nina, do these places offer wireless internet services? Like, do most hotels or hostels you’ve stayed at offer any? …(BLINKS)…whoa, $11 for that room?!? I need to take a trip to Thailand! Oooh…I can’t answer that. I didn’t have a laptop with me, so I pretty much didn’t care whether they have wi-fi or not. They *do* have a computer with a high-speed internet connection though. And yes, it’s pricey. Dear, that $11 room is already considered pricey by some. You want to go to Thailand because of the cheap rooms? Wait till I post about the shopping! melo! Long time no see! McDonalds and Starbucks! who cares! Nina, Do you want the whole world to look and taste like America! Try the local food and drink! Shambara does look nice though, I have a room booked in December for 3 nights. From all reports it sounds to be the place to stay. Will post a comment about it after my stay. Thanks to http://www.Travelfish.org for the recomendation. Staff are very friendly, in all, highly recommended!! shambara is a really good place to stay. it has the most strategic location as it’s so so near to khao san road and yet it can get away from the noise! i was there for 3 nights. very unique, clean, comfortable & peaceful little place. A must-stay-place in Banglamphu area! I’m planning to visit Bangkok next month , and would like to reserve three room at your GH for one night February 4. February 5 AM6:00 ,we will go to Cambodia . can i reserve the three room ? I read a lot about review for Shambara, and read yours too. I kinda freak with private bathroom,but after I read reviews.. well, I convince myself to try Shambara. How’s the shopping and sightseeing around Shambara? i am so booking this place! wag ka maingay, may trip ako sa thailand next year… at di pa alam ni ronnel! ahehe! Hahahaha! Check mo rin HI-Sukhumvit or this!